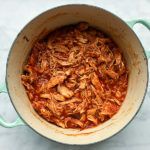 Shredded chipotle chicken is so juicy, flavorful, and versatile that it will go on your menu plan every week. 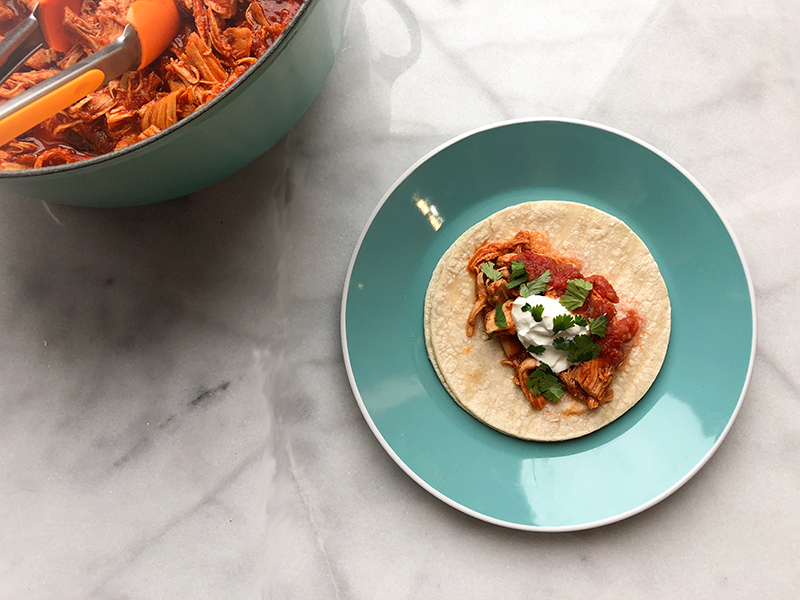 It’s perfect for tacos, tostadas, or enchiladas and it’s only 6 ingredients. 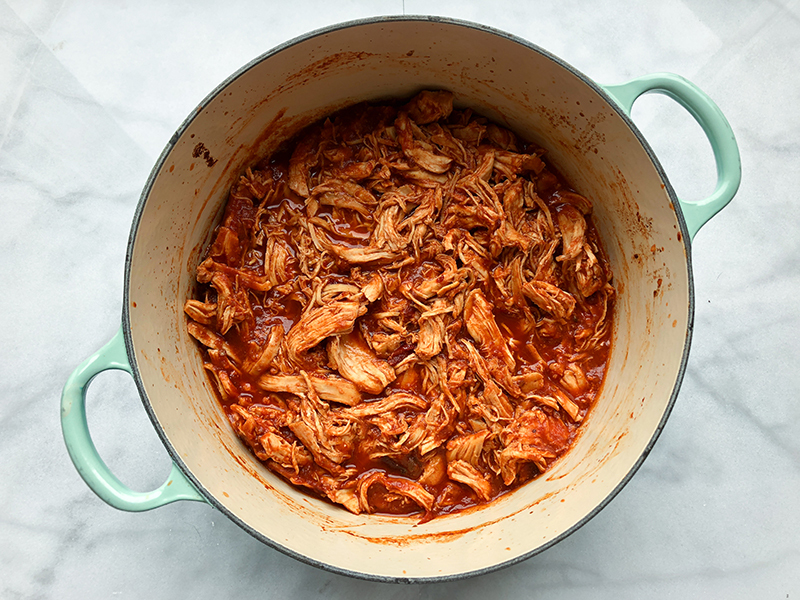 I love making this chicken because it’s so easy – just dump everything into a dutch oven or slow cooker and then toss it into the oven until it’s done! It’s also possible to make it in the Instant Pot, but trust me when I say it works a lot better in the oven or slow cooker because of how thick the sauce gets. It can easily be scaled up for a party, too. The first time I made it was actually for a taco bar! In the recipe card I call for 4 chicken breasts for 6-8 servings, but depending on how you use it, it can probably feed a lot more. When we make tacos or tostadas with it, it usually makes about 12 and sometimes even then we still have extra leftovers. Taco chicken pizza (top a frozen cheese pizza with chicken, sliced black olives, and cheddar cheese and bake according to package directions, then if desired, top with diced tomatoes and crushed nacho cheese Doritos (or similar GF chip brand). My favorite is on tostadas with befriend beans, sour cream, salsa, guacamole, all of the extra sharp cheddar cheese in the refrigerator, and some hot sauce right on top. If you’re gluten-free you will need to check the ingredients on the tomato paste and chipotle peppers, like you would with anything. Most brands are gluten free, though. I use Orrington Farms chicken broth base which is gluten free, but Better than Bouillon is also excellent for those of you who are not gluten free. 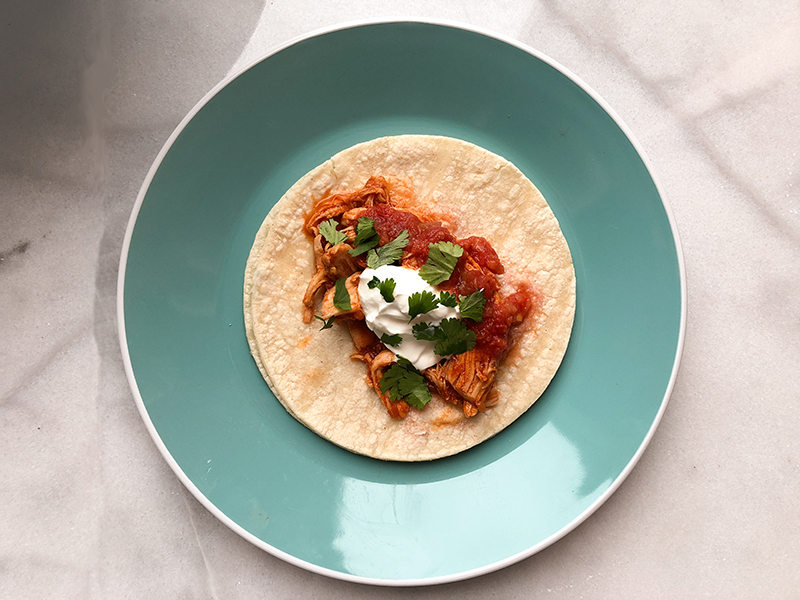 Shredded Chipotle chicken is super juicy and flavorful, and perfect to add to tacos, tostadas, enchiladas, or anything else you can think of. Place chicken breasts in a large dutch oven or other oven-safe dish. Sprinkle with taco seasoning and top with chipotle peppers. Combine broth base, water, and tomato paste in a measuring cup and pour over chicken. Cover and bake for 1 and a half hours, or until internal temperature of chicken is at least 165 degrees F and it can be shredded easily with two forks. Shred the chicken carefully with two forks and add it back to the sauce, stir to combine and serve. When shredding meat, the internal temperature will often be well above the recommended internal temperature for any meat type by the time it can be easily shredded. This is 100% fine and due to the cooking method and sauce, the chicken will not dry out. SLOW COOKER INSRUCTIONS: Place all ingredients in a slow cooker following the directions in the recipe and cook on high for 4 hours or on low for 6-8 hours. Chicken does well on the "keep warm" setting after it's been shredded. What a great recipe. You can never go wrong with a great chicken dish. This would be great so many ways. Love the taco idea. I would use it in pasta dishes, salads…with eggs….in a wrap. The delicious possibilities are endless. 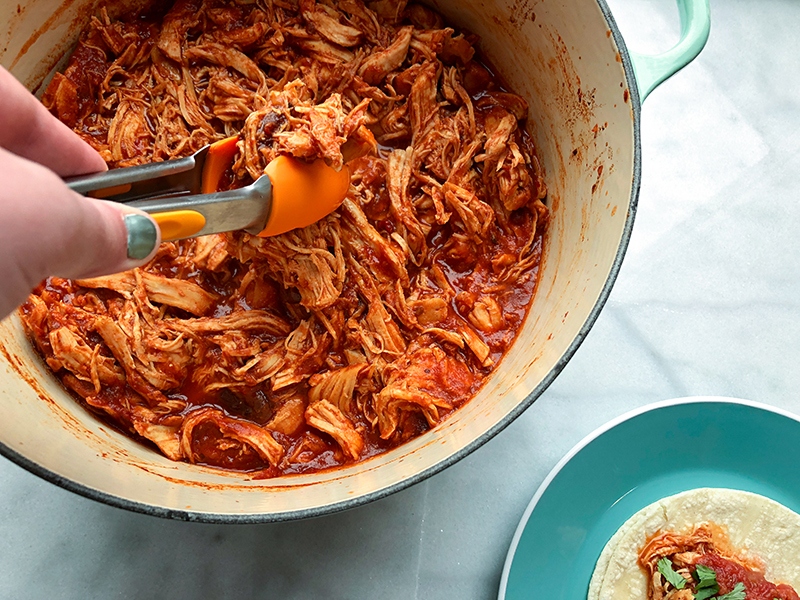 Love the fact that this shredded chicken can be used in so many ways! It looks delicious and I’m sure it tastes great! This looks so easy to make, and yet bursting of flavor. I love chipotle so much, this has to be a big hit! Great recipe! So easy and delicious. Taco seasoning brings lots of flavor. I will try this one in my Instant Pot. Thanks for the idea! 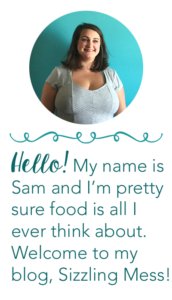 Thanks for sharing this recipe Sam, I a similar meal last Friday night in Sand Diego. Such a hearty looking meal! No-mess tasty recipe? I’m totally sold into this. Is it a freezer-friendly recipe too? Yes! Definitely freezer friendly :). I would put it together uncooked, freeze, and then toss it into a crockpot in the morning – then dinner will be ready and waiting that night! This looks so delicious! I would love to serve this as tacos!